Not sure if you are aware but I'm a Certified Scrum Master. Back in 2014 I wanted to work as a Scrum Master but turns out I love to work with development so I never exercised that role. Lately however, I've been working on a project and realized that as a developer, I wanted to help my company to improve their Scrum. This time, instead of pursuing the PSM II, I decided to go for the Professional Scrum Developer certification. I think every developer that wants to work or works in an agile team should try to get this certificate. Why? Because most teams think they do Scrum right. My experience (as a contractor and employee) is that, it's rare to find a team that does scrum the right way and a company that respects and understands the Scrum framework. 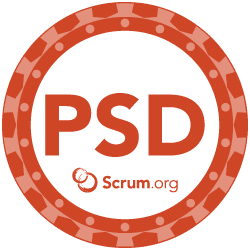 And on the flip side, the certificate shows recruiters and co-workers that the developer studied, understands and knows the foundations of the Scrum framework validated by Scrum.org, managed by Ken Schwaber, one of the fathers of the Scrum framework. First, understand the Scrum Guide. This is the most important resource in Scrum. It may seem simple but you'll see how much each work in there makes sense (and makes a difference). Remember, Scrum is difficult to master. Second, especially for developers, study topics related to agile practices, Extreme Programming and how they apply to Scrum. It's amazing how many concepts were imported from XP for example into Scrum and people most people have no idea that they aren't required. Okay so let's take a look at some tips to pass the exam. The Scrum Guide is the most important document in the Scrum framework. You should read it multiple times carefully reflecting on each word. The recommendation is to understand well the Scrum Guide and the scrum foundations including the associated roles, events, artifacts, and rules. I suggest reading it 3 or 4 times before doing any assessment. You should make exhaustive use of the Open Assessments. Basically they are a subset of the questions that you may encounter in the exam. Suggestion: after studying the Scrum Guide, do a couple of assessments. Validate each of your answer against the assessment answer and be sure to review it back on the Scrum Guide and understand the reason for that. Once you get constant 100% on all exams for at least 3 days, move to the next step. Scrum.org Forum - There is lots of interesting discussions there. Scrum Glossary - describes important terms of Scrum. Also try to find exercise questions and try them. My approach was before seeing the answer I tried to answer it in my mind to then, look at the response. It helped me memorizing and understanding better. Important: don't trust all the answers that you see online. Be critical and reflect if the answer that you see (apart from those in the Open Assessments) is correct. I saw multiple errors around. Be critical! Apart from Scrum foundations, developers will find lots of technical questions. For developers, you can find on this page a lot of relevant information. Professional Scrum Developer Glossary - provides an overview of terms specific to software development teams using Scrum and agile software development techniques. Okay so you prepared well, understood all the Scrum Guide and know the foundations of the related development questions you saw. How to deal with exam time? Grab a coffee and start the exam. Even if you don't consider taking the exam, just studying the Scrum Guide and doing the online assessments is a big step. It's common to see teams violating some of the foundations of the Scrum framework. The result is usually unsatisfied team members, lack of visibility and dysfunctional projects. Knowing what, why not reserve some time to review how's your understating of Scrum doing? For more agile on this blog, please click here.